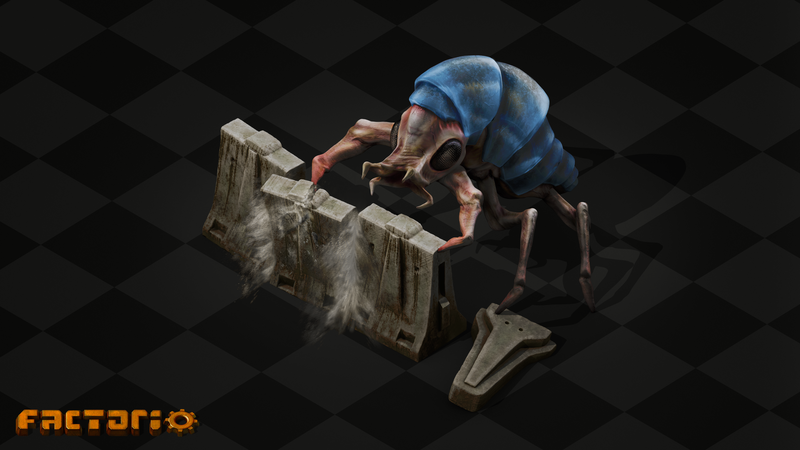 Besides vegetable and plant stuff, biters are the main population on the surface of the Factorio planet. They are the locals, and somehow, from a twisted perspective, they can even be considered the bad guys. Not anymore. The magic of high resolution gives us the chance to move deeper into their conceptualisation and we've added a new ingredient to their formulation: cute...-ish. For the last couple of weeks Ernestas and I have been working on the new version of the biters. Together we worked on developing the concept and ideas behind them, and Ernestas was doing the rest: modeling, texturing, shading, rigging, skinning, animating, rendering, post-processing, and being patient with me and my constant comments and changes. Cute is how we like them, we want you to feel sorry about planning massive biter massacres. In fact we want you to feel pity towards them, especially when you are killing them and destroying their habitat at industrial scale. But also we want you to be disgusted by them, because they are alien to you, and they need to look the part, so it is quite a complicated equation. Basically after the experience in-game with the classic version, we've learned what aspects of the biters are working well, and how to improve the parts which aren't. So we've decided to elongate their legs and accent their eyes in order to provide this more insectoid feeling. Also their new design is optimized for their attacks, they have 2 stronger front legs for providing destruction, 4 back legs to be able to run and stand during the attack, and stronger articulated mandibles to chew on your factories. 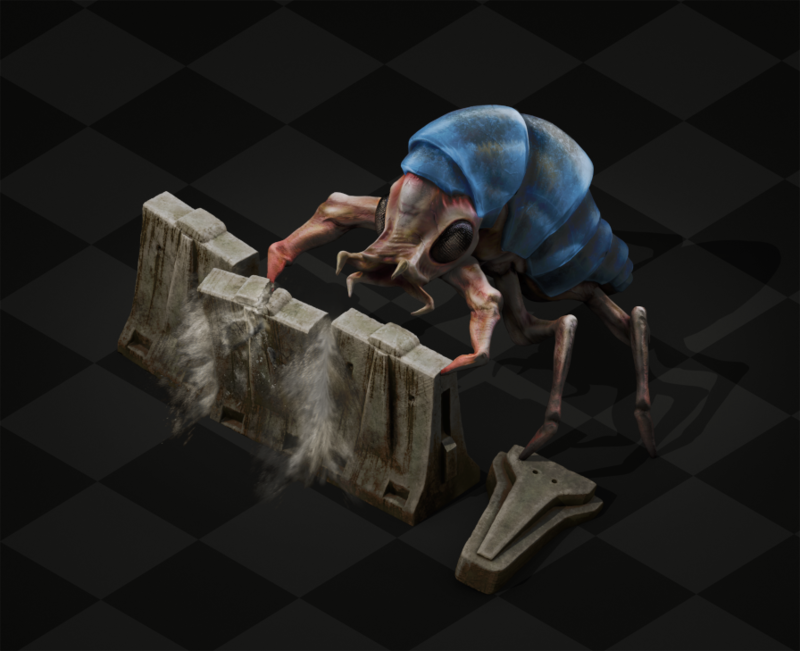 In these animations we can fully see the potential of disgust, the way they move now is more insect-like, similar to a cockroach (many people are disgusted by cockroaches), and also we've balanced the animation loop with their speed in the game, so they shouldn't slide around. Keep in mind that this is still a work-in-progress and we have some more tweaks to do and extra animations to make, like their attack and death. We are also working on their sound design, and apart from that we might have some other surprises to make killing them extra gratifying to watch. Redmew is a Multiplayer community that has been working on some really interesting scenarios. One which particularly caught our eye was the Diggy map. In this scenario the player starts underground, with only a pickaxe, some walls, and a market to buy items. The walls hold up the ceiling of the map, and if you are not supporting the base as you dig-out more factory area, there is a risk of a cave-in. Redmew also hosts other custom multiplayer servers, such as a PvP biter battle scenario, and servers with custom maps. If you are interested in knowing more, you can check out their Discord and Github. You can find the game servers by searching for "Redmew" in the matching server.